So-en was started by Bunka Fukusou Gakuin (Bunka Fashion College) in 1936. It was Japan’s very first fashion magazine. So-en is famed for its excellent features on new exciting trends, Japan’s top fashion districts Harajuku, Aoyama and Daikanyama as well as fashion designers in Japan and the rest of the world. So-en is published by Bunka Publishing Bureau, part of Educational Foundation Bunka Gakuen which also runs Bunka Fukusou Gakuin (Bunka Fashion College). Besides Mrs., Bunka Publishing Bureau also publishes the highly respected fashion magazines Mrs. and High Fashion. Bunka Publishing Bureau has a page with English information about buying subscriptions for So-en, MRS., High-Fashion, Ginka and Stylebook for Mrs. 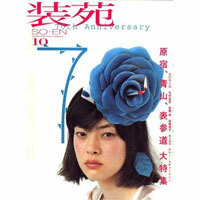 I want to buy the NEW SO-EN FASHION PATTERN CATALOGE. I live in Yuma, Arizona (USA). Please tell me if you sell this cataloge if not, tell me where to buy it in the USA. I only know the magazine. What is the ISBN number of the catalogue? I also want to buy the so-en young style book . I live in Klang, Selangor (MALAYSIA). Pls tell me where to buy it in Malaysia . Where can I buy SO-EN magazine in the USA? I’m in Michigan. I bought it for several years in the early 80s – and would love to buy it again. You can purchase SO-EN from the Amazon link on the top of this page. I don’t know if any store in Indonesia carries it, but you can buy the magazine online at Amazon Japan. The shipping fee is a bit high, so I suggest that you buy several magazines at once (perhaps you can make a purchase together with some friends?). @marte: It is published by Bunka Publishing. The address is 3-22-7 Yoyogi, Shibuya-ku, Tokyo, JAPAN 151-8524. I strongly recommend contacting them in Japanese (use a qualified translator). dimana dong bisa pesen modeblaad so-en? ada yang tau ga?thanks before..
@june tan: You can purchase issues of So-en at Amazon Japan. One issue costs 21.47 MYR, plus shipping. I high recommend purchasing several copies at once, so the shipping charge per issue is lower. how to get so-en book/magazine?thanks..